A few years ago I had visited Amravati near Nagpur. An NRI I knew had for some years funded scholarships for hundreds of school going children. This was their annual meet. A day earlier we had visited an ashram for lepers in Amravati, started by a Hindu saint whose name I don’t remember. And that is the crux of this story. At the annual meet of these poor children receiving scholarships personally funded by their NRI benefactor, one of the invited guests was the city’s Catholic priest. He had been invited by the local contact of the NRI, an auntie who helped administer the programs. When the priest came up to speak, this “secular” local auntie, introduced him as “the most helpful, the one to turn in the hour of need.” The introduction was strangely misplaced since the one person who was really helping the children in this hour of need was the NRI, who funded their scholarships, and their travel to Amravati for the meet. He was himself a devout Hindu, who had spent several years translating Hindu sacred texts in a labour of love. In that incongruous setting, with an incongruous introduction, the Catholic priest of Amravati began to speak. To these wide-eyed children, with palpable gratitude towards their benefactor, the priest starting speaking of M Teresa who had recently been beatified by the Catholic Church in the process to proclaiming her a saint. The priest’s address was laced with bile at some alleged Brahmins in Calcutta who opposed Teresa, and how she had taken care of lepers. His main was to have the local main road named after her. It was a focused and well-practiced diatribe, apparently one he had been delivering regularly around town. It had no reference to the occasion, or to the children who were present. It seemed quite clear that the priest was simply following orders from on high, perhaps given to all the diocese all over India, to make sure that roads and other monuments in all the cities got named after Teresa. No point canonising a saint if the Church can’t milk the name. To my regret, I did not challenge the priest. Perhaps I did not want to add to the sheer incongruity of his presence by creating a conflict in what was to be an inspirational evening for the children. Nonetheless, it was clear that Teresa or her Missionaries had done little for the lepers in Amravati, which had multiple ashrams started by Hindu benefactors and saints for their care. If I had raised a question that day, I would have asked the priest why he did not campaign to have a road named for one of these local heroes of Amravati rather than Teresa of Calcutta. Wouldn’t that be more inspiring and more relevant for the people of Amravati? It is the power of branding that the Church understands well. Even I couldn’t tell you the name of the local saint who started the Ashram at Amravati. There are thousands and thousands of Hindu organisations that work in India without name or fame or conversion agendas. But the branding and marketing by the Church sells us the tale of “Christian Charity” and the fable of Teresa. The difference between organic native culture and centralised institutional Christianity is precisely this. A local community can find a tree, a rock, a mountain sacred. They can have a gram devata, an ishta deva. They can consecrate a temple, employ a pujari. None of this needs approval from a centralised Church or from the jealous monotheistic God. But when the evangelical army lands at their doorstep, they must discard the local, their own. They must give up control. Till it is a village temple, the community owns and controls it. The deity is their deity. The stories are their stories. But once this community is converted, by bait or crook, and a cross is planted on this temple, they no longer own it. It is now a property of the centralised multinational Church, controlled by those they will never see. The stories must come from one book. Their interpretation must also be authorised, for pain of heresy. They cannot even dub a local benefactor, the one they revere, a saint. Manufacturing saints is serious business. It only happens with the authority of Rome and it is a long-drawn multi-year process. It is a big investment by the Church, and it needs to make sure that it has appropriate returns. Thus it is with Teresa. Not only the tortured, the torturers are also sainted. Thus it is that Francis Xavier, who called for the cruellest of Catholic inquisitions onto the people of Goa—Hindus, Muslims and Christians—was made a Saint onto the Church, for his service to spreading Christianity. In that line of illustrious saints Teresa is not all that bad despite Hitchen’s criticism. His main attack that she extolled suffering rather than focusing on removing it, is pretty much in line with other Christian saints. The Buddha too spoke of suffering but he neither loaded it with the guilt of sin nor extolled it. Indian traditions are life affirming. Suffering is there neither for voyeuristic pleasure nor for demonstrations of charity but for moving beyond it. Preying on people’s suffering for conversions, as Teresa’s missionaries were inclined to do, is decidedly bad karma. Be that as it is, there is a dilemma for the numerous Hindu organisations that work with the seva bhava that RSS chief Mohan Bhagwat mentioned. 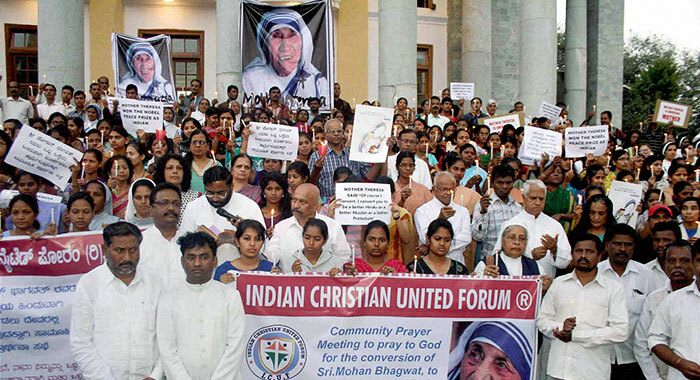 In the world of marketing, exemplified by the Catholic priest’s push to get a road in Amravati named after Teresa; it is common for Indians to buy into the idea that Christian organisations do great charity in India. In fact, as Sandeep Balakrishnan points it, the Missionaries of Charity were a profit centre for the church. The Catholic Church did not fund them. Rather, they made money, collected by marketing the poor, and deposited it into the Vatican bank. They funded the Church. But the average person on the street in India would readily extol their great charity, but be completely ignorant of the hundreds of Hindu organisations that work selflessly and silently. 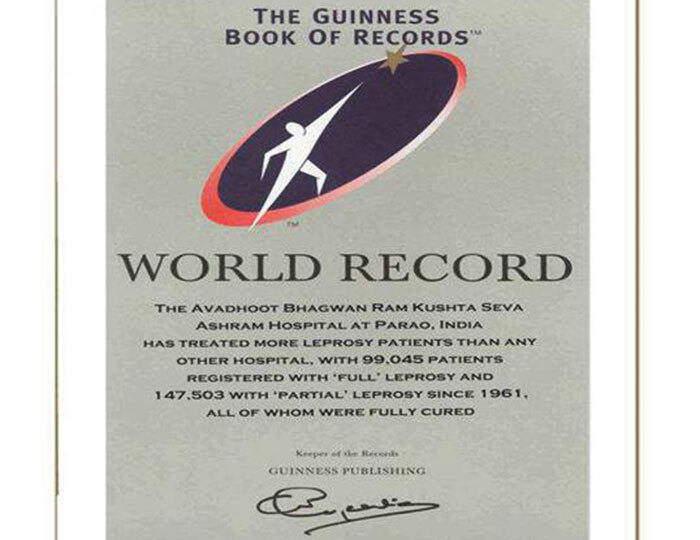 One that recently came to my notice was the Avadhoot Bhagwan Ram Kustha Sewa Ashram reportedly treating the highest number of leprosy patients in the world. These organisations will not toot their own horn. So S. Gurumurthy organised the Hindu Seva fair to highlight some of the work of these organisations. They will not be marketed by a multi-billion dollar MNC Church, so it is up to us to tell these stories.